Microsoft Pix, the iOS camera app that leverages A.I. to help you take better photos, is venturing beyond being a tool for consumers with an update that now sees it able to assist with photos of business documents, whiteboards, post-it notes, and business cards. According to Microsoft, the additional support focused on office productivity made sense because people were already doing a lot of document scanning in the workplace, its data had shown. With the updated app, when you go to snap a photo of a document, whiteboard, business card or another item that’s not a traditional photo, Pix will automatically detect what it’s seeing in real-time and make intelligent camera adjustments to help you get the best picture. After the shutter clicks, the app then uses A.I. to further improve the images by doing things like cropping the edges, boosting the color and tone, sharpening the focus, and tweaking the angle to render the image in a straight-on perspective, says Microsoft. You can see an example of this new feature in action above, where a photo of a bunch of Post-its on the wall is taken at an angle. Pix is able to straighten out the Post-its so you can better read the text scribbled on the note. This image correction technology and the other algorithms involved were already being used in another Microsoft app, Office Lens. That app, released a couple of years ago, lets you take photos of whiteboards and documents for easy sharing to OneDrive, or for conversion into editable Office documents, like Word or PowerPoint files. Of course, many other apps can correct images like this as well, whether that’s an app that helps you snap photos of business cards or receipts, like Evernote’s Scannable, or those designed to help you archive old, printed photos into the cloud, like Google’s PhotoScan. Along with the new productivity tools, today’s update also ships with a set of effects that can be applied to images of whiteboards and documents, like those that can add lines to a whiteboard to make it look like a piece of notebook paper, for example. 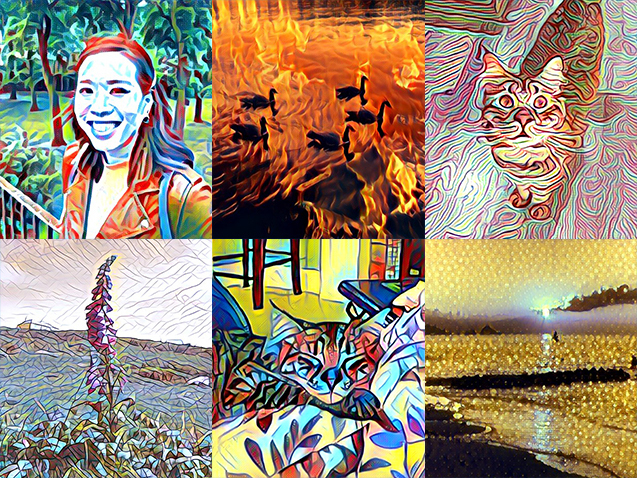 These effects leverage the same style transfer technology that turns photos into art, from the update earlier this year. “So we built a number of effects that are more appropriate for these productivity types,” he said. The updated app is live on the iOS App Store.